Dejen Gebremeskel- Another Ethiopian Track King. Growing up in Gulo-Makeda Woreda, a one horse part of Ethiopia would be considered boring and totally depressing by many youngsters, but not Dejen who simply enjoyed the tranquility his little town offered him. He would wake up very early each morning, attend to his chores and then run a long distance to meet up with school. A routine he maintained most of his growing years and which made him aware of a skill, he never thought he possessed. Soon, he began representing his school in race competitions. That way, he built confidence and sharpened his skill the more. He began competing around the Tigray Region and after establishing himself in local races, he joined the national team to train in Addis Ababa. In 2007, he won his first international medal at the African Junior Athletics Championships, taking the silver medal over 5000 metres. 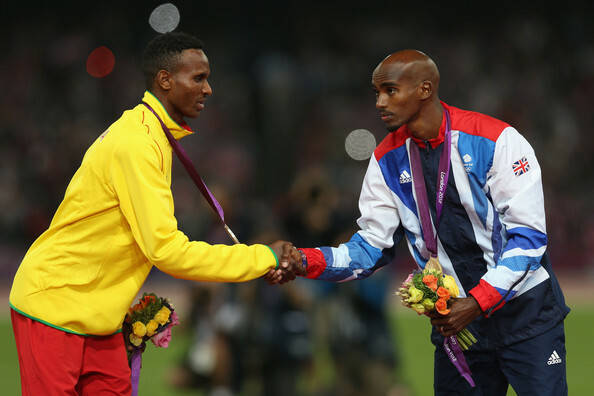 That win opened the door to more rewarding opportunities for the Ethiopian runner. In the same year, he competed abroad for the first time, running a personal best of 13:21.05 minutes to take sixth in the 5000 m at the Flanders Cup meeting in Brasschat. The next year, he ran for Ethiopia at the International Chiba Ekiden, leading the team to victory, with the fastest road relay time. Born 24 November 1989, Dejen is reckoned one of Ethiopia’s fastest runners of all time. His personal best of 12:46.81 minutes for the 5000 meters ranks him as the fifth fastest for the distance. At the 2008 Ethiopian Cross Country Championships (junior category), he finished fourth and was selected for the 2008 IAAF World Cross Country Championships, where he finished 18th. He again ran at the Adidas Track Classic in May the same year and set a new personal best of 13:08.96 minutes, behind his competitor Ali Abdosh. 2009 was a year of transition for the young star. He successfully glided into the senior ranks with his win at the Adidas Track Classic in May and then went on to improve his 5000 m best to 13:03.13 mins by finishing third at the Reebok Grand Prix in New York, where he was beaten only by Olympic medalists Micah Kogo and Bernard Lagat. In 2010, Dejen competed indoors for the first time and finished second at the Boston indoor Games behind Lagat. He was also the runner-up at the Birmingham Indoor Grand Prix two weeks later and was selected to represent Ethiopia over 3000 m at the 2010 IAAF World Indoor Championships. He ran the second fastest qualifying time (a personal best of 7:44.26 min). And like fine wine, the Ethiopian track star only got better with the years and kept his focus on track. 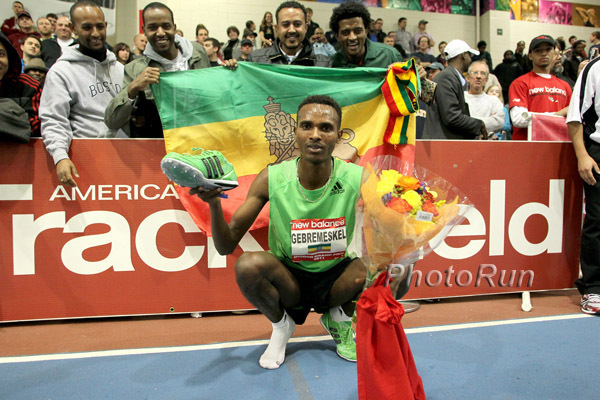 In 2011, at the New Balance Indoor Grand Prix, Dejen defeated Mohammed Farah in the most amazing circumstances – Dejen lost a shoe on the first lap of the race, but he persisted and won in a time of 7:35.37 minutes, making one of the fastest 3000 m runs that year. “It’s really hard to run in one shoe,” Dejen, said afterwards. Sounds quite unlike his fine compatriot Gebrselassie, who preferred to run without his shoes on, for a long time. Dejen won the Carlsbad 5K race in April, beating Eljud Kipchoge and took his first win on the Diamond League circuit with a victory at the Adidas Grand Prix New York. A run of 12:55.89 mins at the Golden Gala made him Ethiopia’s second fastest 5000 m runner that season and got him a spot at the national team for the 2011 World Championships in Athletics. 2012 season wasn’t bad either, Dejen improved his 3000 m best to 7:34.14 minutes at the XL Galan, but got a bit slower at the IAAF World Indoor Championships where he finished fifth in the event. In March 2012, he won the Carlsbad 5000 for a second year running. He celebrated two 5000 m wins at the IAAF Diamond League circuit in the same year, including a personal best of 12:46.81 minutes, making him the fifth fastest ever over the distance and earning him a spot at the 2012 Summer Olympics. He ended the year with a fourth place finish at the Weltklasse Zurich, finishing second in the Diamond League rankings after Isaiah Kiplangat Koech. An amazing third straight win at the Carlsbad race launched him into the 2013 season. He finished 16th in the 10,000 metres in a time of 27.51.88 at the 2013 World Championships in Athletics. In the same year, Dejen held the world leading time for 10,000 metres of 26:51.02, which he set at the Folksam Grand Prix in Sollentuna, Sweden. 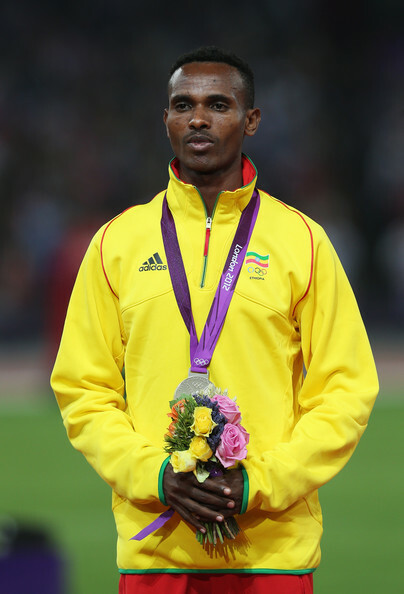 At the 2014 IAAF World Indor Championships in Moscow, Russia Dejen Gebremeskel scored a bronze medal in the 3000 metres with a time of 7:55.39. Dejen is sure set for the big marks. He just can’t go slow. Its all about empowerment!…when you value a person, you tap in to his or her potential… And we love the athletes because they demonstrate to us in minutes of life span, things we try to figure out by living life each day for years. Amazing stuff you are doing, keep it up!